As any cat owner can tell you, our feline friends love chasing the uncatchable dot of a laser pointer. Unfortunately, though, there is only so much time in the day that you can spend playing with them and catering to their natural instincts… so why not automate the process? 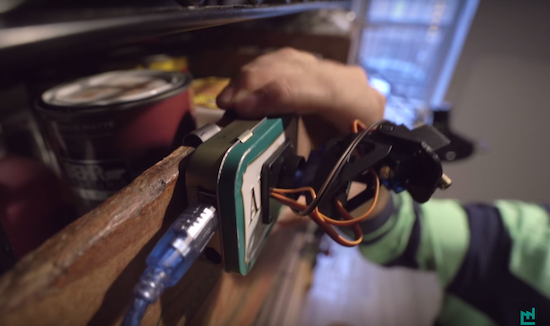 This is exactly what La Fabrique DIY decided to do using an Arduino Uno, two servos, a pan/tilt camera mount, and an Altoids tin to house the electronics. With some programming, the tower moves the laser “pseudo-randomly” to mimic the behavior of an insect. So if you, like La Fabrique DIY, have a cat in a small apartment with not much room to hunt, head over to the project’s Imgur page to start building a distraction device for yourself! Actually many _responsible_ cat owners (and pet lovers in general) will tell you that making your pet play with an uncatchable toy is not funny. It’s frustrating: they cannot touch it (that’s how they know they caught it) and, despite the hard work chasing it, it keeps escaping. It is a cool project. A few days ago I saw this on imgur and immediately ordered materials (now waiting for them). And yes you should give your cat a reward after playing.